As more pre-orders arrive on the doorsteps of intrepid Wastelanders, we’ve seen a marked increase in the amount of people sharing their Fallout creations all across the internet. Two friendly and easy to navigate hubs for conversation, Q&A, sharing your projects and hanging out with members of the F:WW community are the unofficial Facebook Group and the official Fallout: Wasteland Warfare Modiphius Forums. While the number of active players increases, so to does the demand for more products and miniatures that represent the factions and characters that we all know and love from across the Fallout series long history. Luckily, Modiphius have us covered in that regard, with a huge amount of Resin Miniatures resting on the horizon covering everything from Fallout 1 to Fallout 4. The following is a list of miniatures which have visible renders and/or have been confirmed by way of the Modiphius development blog. Everyone likes a good list. Frank Horrigan in Custom Power Armour powered by Microfusion Reactor and armed with a Hardened Composite Blade and Arm Mounted Plasma Cannon. The Mysterious Stranger wearing a Fedora and Trench Coat, armed with signature .44 Magnum. Sole Survivor in X-01 Power Armour with Modified Laser Rifle and accompanied by Dog Meat in Armour. All in all, there’s plenty of lovely stuff on the way, but for now we must wait. And waiting is the hardest part. That’s all for now, thanks for reading. The time has come to dust off your lock-picks and put on your scientists outfits, we’ve got an unboxing to handle! For your own convenience and the sake of brevity I’ll get right down to it and keep this concise, your here for information and not my opinion after all. But before we go on, here’s a copy/paste refresher of what’s listed on the Modiphius Store Page. Check the scale reference image to see how big the Deathclaw, Super Mutants, T60 and humans are. The Behemoth is shown for reference only. The box itself is as sturdy as you could ever want it to be. None of that flimsy card you would find in the likes of a Battleforce or Monster Army Bundle. This thing is rock solid. It’s decorated front and back with artwork and informational images showing the contents. Upon removing the box lid, you’re met with the grin of a Vault Dweller armed with a Super Sledge, wearing the re-designed Fallout 4 Vault Jumpsuit and Pipboy. This is your “Getting Acclimated” book which will give you a brief rundown of the games basic mechanics that will facilitate your wasteland wanderings. It’s brief, it’s high quality and it’s unmistakably Fallout. Beneath that you’ll find two thick card sheets of the games various double-sided tokens that will serve as your objective markers, wound trackers, points of curiosity etc. What’s particularly nice is that there is more than enough for a two player game in the box and Modiphius have gone ahead and included two sets of range finders, meaning no more swapping back and forth of range finders. Underneath the tokens you’ll find your full “Rules of Play” rulebook. No skimping on content here, this is the full rulebook. And as a playtester, I’ll let you know now that everything in the game is covered in that book. No need to scour the internet and forums to find the answer to a game query you might have. You will also find the full “Campaign Handbook” in the box. Fair warning, the Campaign Handbook goes hard on adding more life and a lot more depth to you Fallout Wasteland Warfare games. I would advise you don’t even touch it until you’ve played a number of Narrative Games and have a firm grasp on the basics. Underneath that, you’ll find two pieces of fairly thick paper with a decently high quality printing of The Commonwealth from the Red Rocket area just shy of Sanctuary Hills. Unfolding these two prints and putting them side by side gives you an excellent looking playing space for the game if you haven’t got one available already. You can actually upgrade to a proper version of this here. Under this, you’ll find all the cards you need to play the game nice and safely sealed inside plastic. And you’ll be pleased to know that the plastic isn’t tight enough to cause warping. This covers the Alien pre-order bonus if applicable, the Super Mutant Faction, the Survivors Faction, the Deathclaw and all your weapons, armours, equipment pieces, food, drink and more. To go along with your cards and tokens, you will of course need the dice! In the box you’ll find two of each D12 and one of the D20 skill dice that will decide your fate in the Wastes. These things can be gifts from god or the worst possible thing to have ever happened to you in gaming depending on your rolls! So roll well, don’t be a dice dropper! THE BOX IS A STORAGE SOLUTION! HALLELUJAH!! The PVC miniatures are obviously not going to be as sharp as their Resin counterparts, that’s a given, but these guys really do look great. And the bright Green castings clearly mark them as being a separate faction from the Survivors who come in Grey. Which means if you aren’t a big fan of painting, you’ll be able to clearly distinguish your miniatures from your opponent. Not a crooked arm or bent barrel in sight! The Survivors faction stills looks incredible too, especially with that hulking suit of T-60 Power Armour. And that’s all there is to it, an incredibly content rich box for you to get started in the Wasteland! Thanks for taking the time to stop by. Crawl out through the Fallout baby! Bolt down your windows, barricade your doors! Signal for help and grab a weapon! THE RAIDERS ARE COMING! The newest showing from Modiphius is The Raider faction for Fallout Wasteland Warfare. Drawn from the dregs of Commonwealth Society, the Raiders form warbands that are a dangerous rabble indeed! Starting strong with three named characters, Ack Ack pours lead down range with a huge Mini-gun! Avery unloads with a Short Combat Rifle! Sinjin takes aim with a modified Pipe Pistol! These characters, coupled with the ability boosting strength of the Heroic Card, means your Raider Warband will be a force to be reckoned with. Your Raider Warband will grow as you start to add Raiders, Scavvers and the rightly feared Pyscho’s to your roster. Standing proud, strong and indomitable amid this force of armed and dangerous wastelanders, is the Veteran Raider Boss. Clad in a suit of Raider Power Armour, she towers over her Raider subordinates, preparing to lay down torrents of 5.56mm caliber fire from her dual wielded Assault Rifles. The best offense, is a good defense. But a good defense is improved by lots of offense! We are all on the lookout for terrain and scenic pieces for our tables in anticipation of Fallout: Wasteland Warfare, and many of us have been turning to TTCombat and their fantastic line of City Scenics. Well, TTCombat have once again delivered the goods with their astoundingly thematic Phoenix Fizz Vending Machines. Nuka Cola is the drink that was made famous in the Fallout franchise, but everyone is going to have a Nuka Cola machine or two on their table, right? So why not swap it up a bit and introduce some unique flavours to the Wasteland and Commonwealth with Phoneix Fizz? These 4.6cm (1.8 inch) tall vending machines are beautifully cast in Resin and come with 4 doors which you can attach to the machines, and two optional back-panels for the machines. One plain and one decorated. Inside the machines, you’ll find 4 bottles of Phoneix Fizz on the front shelf, and at the back we can see the inner workings of the refrigeration unit. Specifically engineered for games that are 28mm – 32mm in scale, you’ll almost certainly want to add a set of these to your Wasteland Table. For a scale comparison, the photo beneath has both Phoenix Fizz Vending Machines, plus accessories, with a Primaris Space Marine. For only £8, you would be mad to miss out on these excellent scenic pieces. After a decently long stretch of time, the Info-blog is finally being updated again. How often will these updates come? Nobody knows. But for now, let’s just roll with the punches. First of all, who likes miniatures? There’s plenty of Power Armour on the Horizon for you, as well as our favourite Synth Detective, Mirelurks and their Queen, Vault Dwellers, Reilly’s Rangers, a sundered XVB02 Vertibird and more. Once you’ve torn your eyes away from those, why not have a read through some questions I put to Fallout: Wasteland Warfare designer, James Sheahan. Questions were drawn and based on community questions, notably from the Fallout: Wasteland Warfare community. Q – Talking with members of the Fallout: Wasteland Warfare community on facebook, you spoke about how The Settlement Deck, “adds lots of equipment, weapons, mods, chems, power armor, boosts, quests, perks, leaders and explore cards to your game.” Would you like to expand upon that? Can you comment on how The Settlement Deck will interact with the Settlement Systems rules and how players can expect this to shape their game? A. The Settlement Deck is a deck of 119 cards which is an expansion that adds variety and new content to any game. It’s named the Settlement Deck because it’s especially useful for players that want to play using Settlement mode (as it adds to the types of cards that players will potentially draw during Settlement mode); however, it’s an expansion deck useful to all players. If you are playing without using the Settlement system, you’re free to use almost anything in your force so the Settlement Deck expands your options as well as the items you may find during games. If you are playing using the Settlement system, your force is limited to the basics plus some of what you gather between battles (depending on the structures in your Settlement) and the Settlement Deck means there is more variety to what you may draw. However, it’s important to note that players don’t need the Settlement Deck to use Settlement mode. How did the variety of forces at play, and how they can interact with each other in the game, shape your approach to designing the rules? A. When designing Fallout: Wasteland Warfare, I was always conscious to ensure enough granularity was included so there were enough tools (behind-the-scenes) with which to build the various units, weapons, equipment, effects, etc. in the Fallout world with enough significant difference. So, from the start, I set out to create a modular game where you could combine different models with different weapons, equipment, abilities, etc. but also with modularity within these items too such as the different ranges, dice, damage, effects of weapons, or the different attributes, skills, abilities, etc. of the Units. This tool box would then allow construction of all the different characters, creatures, equipment, etc. and each faction could have its identity too. A good example is the Unit skills which can each be attached to any attribute so being able to survive a few hits in battle isn’t only ever due to being really muscular but can be because they are agile, and being great at searching can be due to perception, or intelligence, or even luck. A. In regular play, you can mix almost any faction with any faction because of those things I mentioned before where players have their own in-game reasons for exceptions. The only real disadvantage for not having the same faction throughout your force is that those that are not the same faction as your Leader do not gain the benefits from the Leader. Battle Mode is different though and the Development Team have created the Battle Mode force building system and lists which are specific about what can and can not be used/combined in a force, both in terms of the balance of models as well as which factions. Q – At one point during another community interaction, you mentioned that, “we may also make special versions of some characters with special Unit cards too, like the Sole Survivor Loner I mentioned who’s still a Survivor but has different stats/skills/abilities.” If the plans to make special versions goes ahead, can we expect other special variants of existing characters, and do you think other characters will be given this treatment? A. Fallout is an interesting world to capture as (without spoiling any of the video games) some characters evolve or change during the games, and Sole Survivor is different for every player as you choose how to develop them as you play. Having alternative Unit versions of some characters allows us to explore some of these. Expansions include cards that allow a player to use the models they contain, but rather than provide the same Unit cards that a player may already have, these usually come with alternative versions of the Unit cards (plus the weaponry/equipment/AI may vary too). This gives a player that buys an expansion even more variety (plus there are various other cards with every expansion too). For example, the Heroes of Sanctuary Hills in Wave 1 includes a different model of Sole Survivor (male) and Dogmeat (with goggles) compared to their models in the two-player starter set. This set comes with Sole Survivor Loner and Dogmeat Scout Unit cards which are slightly different to their cards in the two-player set. This is the same for non-characters too; for example, the Hammer expansion in Wave 1 contains a Super Mutant Hound model and comes with a Unit card called Mutant Hound Fiend which is an alternative version of the Mutant Hound. Of course, you don’t have to use the Unit card that came with a specific model so you could use all your Mutant Hound models with a single Mutant Hound Unit card or Mutant Hound Fiend Unit card, or split them any way you wish. At present, there are only alternative versions for this reason (except Sole Survivor and Sole Survivor Day One which both come in the two-player set). We’ve talked about maybe doing alternative versions of some characters in the future (just as cards) but it’s just in the ‘things to think about’ column at the moment. Q – The love for Fallout runs deep with fans like myself and many millions of others. So jumping off from the last point about special versions of characters, should we look forward to seeing The Vault Dweller, The Chosen One, The Lone Wanderer and maybe even The Warrior from Fallout Tactics? Possibly even The Initiate from Fallout: Brotherhood of Steel? Do you think it will be viable from a game design point of view to have so many variants of a character that effectively fulfils the same role on the tabletop? A. Alternative versions are an interesting balance as they need to be different enough to each other to feel/act/play differently but not so different that they lose their common values. As a result, I think all characters (units) have limits to the maximum amount of variants they should have. The player’s hero in the Fallout games probably has the most scope for versions as we can all develop our character very differently during the video games. Of course, adding the modular equipment, perks, etc. to a Unit can also create further variations so players can create many specific feels even if not present as a single Unit card. Can you confirm whether or not players will have access to these rules, or will a purchase of the Deluxe Rulebook be required? A. All the above are true, Chris is right that the rules will come on a card with the car model, plus they will be included in the deluxe rulebook as that will have more room. However, Chris was just mentioning the physical versions and the exploding car rules will also be available online for anyone for free. Q – Finally, in another community interaction, you mentioned a long standing rule of wargaming. That rule being, “you can house-rule using anything with anything if your opponent agrees.” A friend and I have a homebrew rule that says if a model in power armour jumps off a Significant Edge, any units within Orange Range suffers Push Back of Orange Range. So is there any sort of mechanic or rule that you would have liked to put into the game, but weren’t able to? A. I think it’s great that players make rules that suit their needs – everyone’s wants are slightly different and it’s their time and their entertainment, so they should get what suits them – it’s meant to be about having fun. I should point out, just in case, that house rules aren’t usable in official campaigns/organised play run by Modiphius or Vault Dwellers. I have been fortunate that there isn’t really anything that did not make it into the game that I wanted to be there. Some elements got streamlined along the way which was good and part of the process. If you saw my original unit card sketches that I made to explain my design to Chris, you’d be surprised how similar they are to the final card layouts. Even the rule for potentially getting one last dying action if a Ready model is removed made it in. And there you have it. The first actual update to the Fallout: Wasteland Warfare info-blog since October 3rd 2017. That’s all for know, thanks for reading. Fallout Wasteland Warfare Available for Pre-Order. It has been a long while coming, but Fallout Wasteland Warfare is finally available for pre-order on the Modiphius Store Front. So head on over and see what tickles your fancy! Crawl out through the fallout, baby! With pictures from Gen Con flooding the internet, there has never been more love for the upcoming Table Top War Game, Fallout Wasteland Warfare. With the exposure that Gen Con brought, and the huge collection of revealed Sculpts already available, it’s easy to see where love is coming from. So what news from the front? Well, it has been quite some time since we’ve heard anything in regards to new Named Characters coming to the game, but it has been confirmed by way of the Official Modiphius Facebook Page that the one and only Paladin Danse of Squad Gladius is still coming to the game. In fact, he may be further along than you think. Paladin Danse has been submitted to Bethesda for approval, meaning he’s closer than ever to appearing on your table top. We haven’t heard Danse be mentioned since back in May, so this is good news for Brotherhood of Steel fans. With the addition of weapons and gear, it will be easier to build your characters using the equipment you want. Fallout Wasteland Warfare Starter Set Price Estimates & Upcoming Factions. 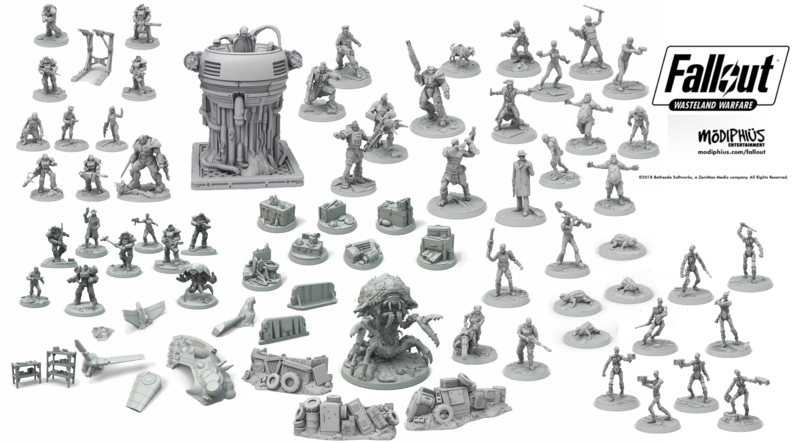 Yesterday, we detailed the contents of the Fallout Wasteland Warfare Resin Starter Set and had a brief chat about what you can expect to see in the PVC Starter Set which is expected to arrive some time next year. That £65-£70 / $80-$90 includes a Female Vault Dweller (Nora), Dogmeat, One Brotherhood of Steel Aspirant in T60 Power Armour, Three Settlers, One Super Mutant Brute, Two Standard Super Mutants, Two Super Mutant Hounds and their scenic bases, all the dice required to play the game, all the required counters, a rule book, scenarios and unit cards as well as quests and gear cards. It also includes the highly interesting AI cards that control units in singe play. In other words, you’re getting everything you need to play the game! It has also been confirmed that at launch The Survivors, Super Mutants and Brotherhood of Steel will be available. The factions that will be following them are the much sought after Raiders, Institute and The Enclave. Fallout Wasteland Warfare: Starter Set Contents Information. Speaking through the official Modiphius Development Blog and a BoardGameGeek Thread, Chris Birch has revealed some new information regarding the upcoming Resin Starter Set and the PVC starter set that will be coming next year. The PVC starter set which is expected to ship sometime next year will contain some different units and scenarios to help reflect this. The PVC set is expected, but not set in stone, to be a Brotherhood of Steel team of roughly 9 miniatures and a Super Mutant force of roughly 9 miniatures. This is to help players get a wider variety of units rather than buying duplicates. A small expansion is planned for players to get their hands on The Male Sole Survivor (Nate) as well as Cogsworth and a variant version of Dogmeat. Fallout Wasteland Warfare: Player Turn Breakdown. Gen Con 2017 is going strong and the turn out has been, as expected, exceptional. One attendee, Brian Bosch from the unofficial Fallout Wasteland Warfare Group, was kind enough to relay some information to me regarding the game and the demo session he took part in. To open, he clarified that the demo team stressed that the game is still in development and that this was brought up many times when questions were asked in regards to the games rules. As we cover character stats, you can cross reference them with the pictures attached so you an get a better understanding of how they work within the game. The demo session that Brian took part in saw him assuming control of The Sole Survivor with a Combat Shotgun equipped vs a Super Mutant enemy. As previously shown in the Rule Set from Gen Con, players can take two actions in their turn. Brian opted to go on the offensive and made two shooting attacks against the Super Mutant. When making a shooting attack, you first measure the distance between yourself and the target using the coloured range finders as dictated by your weapon card. As you can see in the image above, the Combat Shotgun uses Red and Blue range finders to determine Close Range and Long range. Brian consults The Lone Wanderers Perception Skill and uses a White D20 to determine whether or not he hits the Super Mutant with his shooting attack. He successfully rolls a 7 or under, hitting the target Super Mutant! Because the attack was being made from within Short Range, Brian adds two black dice to his roll which add Damage Modifiers, inflicting damage on the Super Mutant and bypassing its armour. Had the shot not been strong enough to bypass the Super Mutants armour, the controlling player would roll a Red D12 in an attempt to block some of the incoming damage by rolling equal to or lower than the specified amount on their stat card. [You might also notice the Critical Point icon which reads, “!4 SHORT ONLY”. For example, our Lone Wanderer requires a 2 or lower to block the same amount of incoming damage. As has been previously mentioned numerous times throughout the games development, these stats can be change and improved by using pieces of gear, armour and equipment, but these were not used in this demo session. Unfortunately, Skills like lockpicking and searching weren’t used in the demo session. For those of you that still haven’t done it, I advise you catch up on the Development Blogs here, and download your free copy of the Modiphia Magazine here!